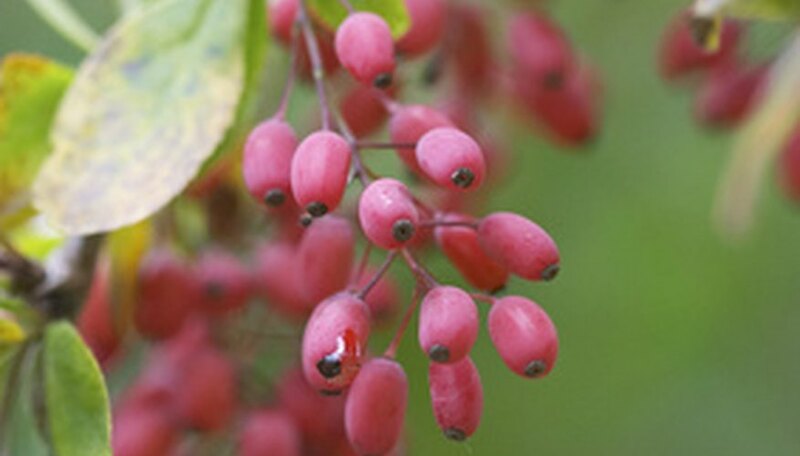 With more than 450 species of barberries, these hardy shrubs provide bright color and attractive foliage. Barberry shrubs are striking planted along a garden border or along a front walkway. The barberry bush prefers rock soils but is versatile and tolerates moist types, as long as they are well-drained. Beginning in the fall, the barberry leaves deepen and the bright red berries shoot out for a brilliant landscape design. Japanese barberry is a deciduous shrub that grows up to 6 feet tall and 7 feet wide. Its dense, rounded shape has a medium to fine texture with pale yellow flowers. These small flowers emerge every spring and often are hidden under the foliage. The bright red berries of the Japanese barberry come out in the fall and last into the winter. Japanese barberry has bright green leaves that are long, narrow and range from 1/2 inch to more than 1 inch long. Beginning in the fall, the leaves turn orange and bright red for a colorful addition to the landscape. Japanese barberry prefers sun to partial shade and can tolerate a range of soils. It is easy to plant and drought tolerant, making for a very hardy shrub to grow as hedgerow inside the garden. The USDA hardiness zones are 5 to 8. Paleleaf barberry is an evergreen shrub that prefers well-drained, moist soils to thrive. This shrub grows up to 4 feet tall and 5 feet wide, making for a very dense, low growing barberry variety. Its medium to fine texture and arching stems are ideal along a rock garden or grown as a ground cover. Beginning in early summer, the bright yellow flowers emerge and contrast with the dark green, leathery leaves. The leaves range from 1 to 2 inches long and have pointed ends. During the winter, the leaves have a red tinge that lights up the landscape with color. Paleleaf barberry prefers full sun to partial shade to thrive and can withstand a harsh pruning every year. The USDA hardiness zones are 6 to 8. Wintergreen barberry is a slow growing evergreen bush with a rounded, dense form. It grows up to 6 feet tall and 8 feet wide. When planted, the wintergreen barberry makes an ideal privacy screen along a backyard patio. The wintergreen barberry has tiny yellow flowers that shoot out in the spring. They are oval in shape and less than 1 inch long. The dark green leaves of the wintergreen barberry are lustrous and long. They range from 2 to 3 inches long and turn a deep red color in the fall. This hardy barberry variety is drought tolerant. The USDA hardiness zones are 6 to 8.